I own a Triumph Tiger 800. And I'm afraid that I won't be able to afford to fix it if I drop it. 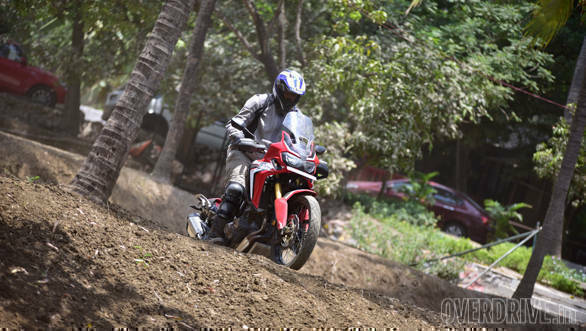 That's what I went to learn at the Top Gun India Adventure Riding Academy. The Academy was held over the past month or so at multiple locations, I attended the one in Mumbai - the very first one. The star attraction was the lead instructor, Bret Tkacs. Tkacs runs MotoTrek, a popular YouTube channel that talks about adventure bike riding skills. Tkacs is an adv riding trainer with more than 20 years of experience in adventure riding training. Tkacs is also a military sportbike rider course instructor and conducts army traffic safety training program in America currently. 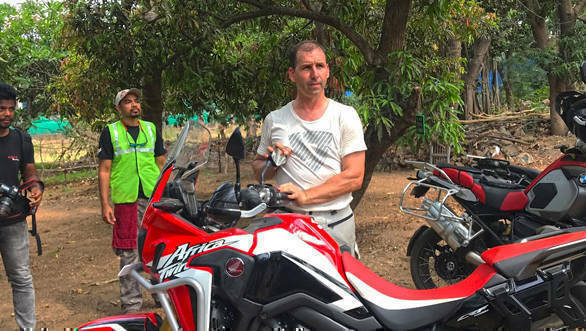 Could Bret and Top Gun India teach me the skills needed to end my fears and allow me to explore all the places I always imagine I'd take Starscream (yep, that's what I call it) to? Who is Top Gun India? 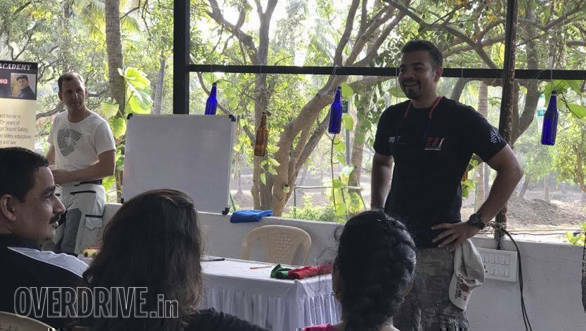 The Top Gun India Riding Academy, earlier the Vortex Racing Academy, was founded by Mumbai-based motorcycle racer Vikrant Ghate. 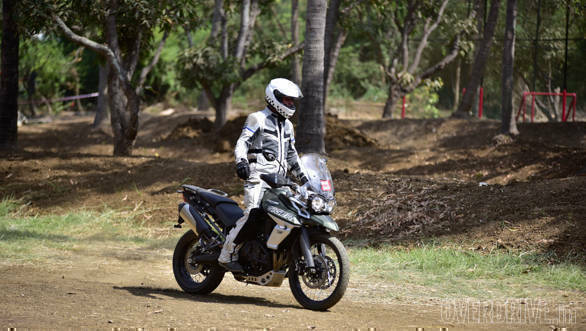 The academy conducts track riding schools at the Mohite karting circuit at Kolhapur and signed on Bret Tkacs for the adventure riding training programme. The riding academy was a two-day event. Rs 18,000 for the event covered the two days of tuition as well as food and beverage. I didn't go for the food and that was probably a good thing - the riding was great but the grub wasn't. 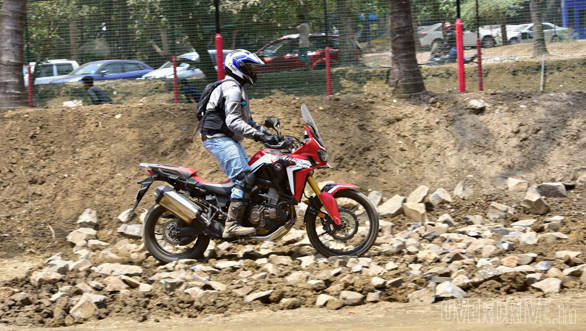 The Honda Africa Twin's capability to ride on any possible terrain along with the DCT came in handy during this training. Conveniently for me, at least according to Shumi, my Tiger just didn't have the tyres for the academy. 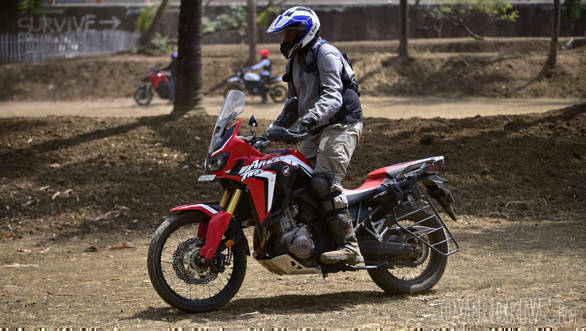 So I borrowed Shumi's Honda Africa Twin for the two days. And why not? 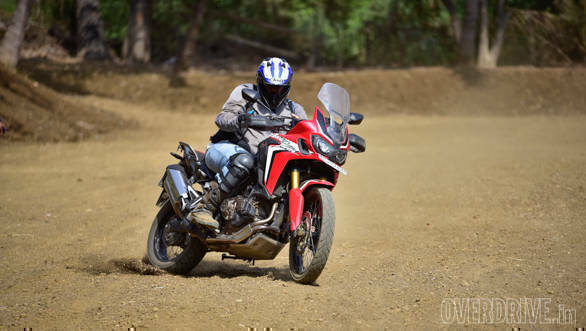 The Africa Twin was easily the best off-roader when we took the big advs to Ladakh last year. So, shall we start? 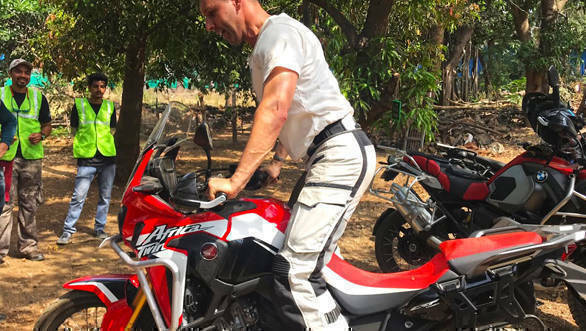 Bret insists that getting to know your motorcycle is essential before you climb on and ride off. He started this process by holding up his ride, a 2018 Triumph Tiger XCx, by just the windscreen. Think about it. Just the windscreen, with one hand. Then he did the same thing with one mirror, a turn indicator... At one point, he had just two fingers holding the 200+kg motorcycle up! The point he was making was that finding the right weight balance-point makes it easy to manage a large, heavy motorcycle. It's not a trick, it's a skill. I practiced this on the 'Twin by a mirror and then to other bits until I had the confidence to hold it up using just the windscreen. Adventure tourers are tall and swinging a leg over isn't always easy. I already knew that the normal method is to climb up on the side-stand-side footpeg and swing the other leg over. Tkacs had other ideas. He called it the 'jungle gym' way. 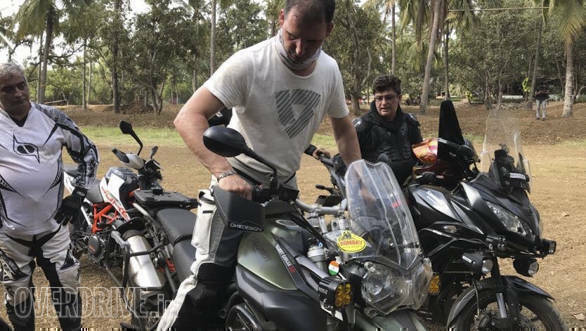 He not only mounted a students GS from the pillion seat, he showed us that you could climb on even from the high side of the bike without causing a fall. The trick is to position the body over the motorcycle in a way that the weight gets distributed between the tyres and the stand and not just the right side footpeg. Took me a few tries and aching thighs but I did climb on to the Twin without breaking anything more than a sweat. 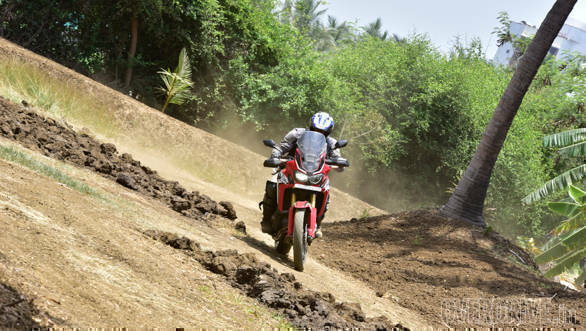 With the correct riding position, it becomes super easy to ride an ADV on any terrain, be it on road or off. Tkacs then showed us the correct riding position. Starting with the head, one needs to look as far as possible, and not at the obstacles immediately ahead. This helps planning ahead as well as prepares you for what's coming. Elbows should be bent and loose while the forearm and wrist should be in one line. This helps you remain flexible on the bike - both sitting and standing up. When standing up, you must lean forward to weight the front wheel adequately. Tkacs told us to lean back and weight the rear wheel when going down a slope. When I tried this, the Africa Twin immediately felt more controlled. My aching thighs? They were at work. The inner side of your knee is supposed to clamp on to the bike, said Tkacs. Helping them are tightly tucked in feet. The intention is to lock the motorcycle to the rider using the lower body so that the upper body can relax. This lightens the feel of the bike when you try to manouvre it, always useful on a hefty motorcycle. The intention is to lock the motorcycle to the rider using the lower body so that the upper body can relax. Next was the role of where your body is on the bike to promote control. Try this. Try balancing the bike with your feet up while stationary. You're looking for the balance point and you will see that how your work your body affects this intensely. This exercise will also prepare you when you're losing your balance on a trail or if your foot slips off the peg. On tarmac, we lean into the corners, effectively putting our body between the road and the bike. But in the dirt, Bret explained, you lean the motorcycle while you keep the body upright and counterbalance the lean. When turning left, the weight is on the right footpeg and vice-versa. We learnt this by riding a slalom course (a zig-zag through a series of cones) at slow speed. 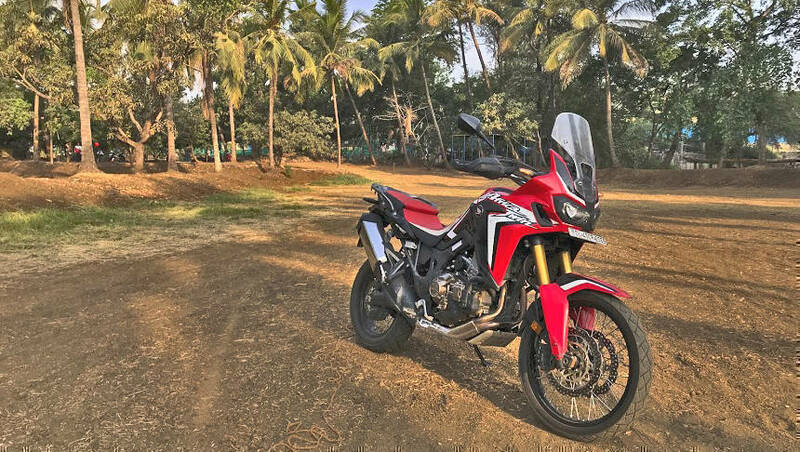 The Honda Africa Twin's slender build made this quite easy. Tkacs warned us not to lean on the handlebar, that's only meant to change direction or regulate the throttle. 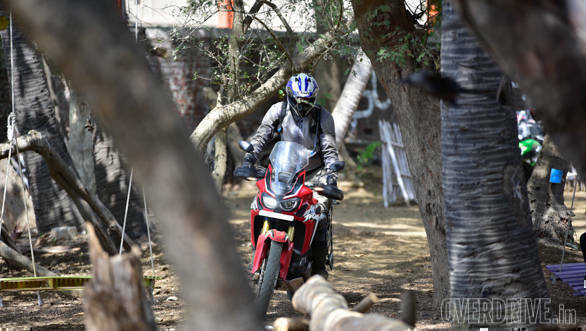 So working the bike through the slalom with the body - sitting or standing - was easy on the Africa Twin. Standing turned out to be easier because the Honda's tall windscreen limits your vision. On tarmac, once again, you lean forward when riding. But off-road you may not always have flat ground and that changes things. Tkacs told us to lean back and weight the rear wheel when going down a slope. When I tried this, the Africa Twin immediately felt more controlled. I thoroughly enjoyed the small 'hillocks' on the school course - reminding myself of school days when my cycle and I conquered many a molehill. And then, day one finish! On the second day, all of us were feeling a little more confident. Bret countered this by opening up new parts of the course layout - deep trenches, rocks and loose mud. This is what, usually, I'd ride around. But with the correct riding posture and our new confidence, I was willing to try these for size. I asked Bret which brakes to use off-road, a common newbie question. We were told to use to both off-road because the surface is inconsistent. When turning though, Bret said, you do use more rear brake than front. If you're fully loaded though, too much rear brake can cause an unplanned slide. Our next drill was to work combinations of front and rear brakes to understand how it affected stability. Falling comes with motorcycles, more so off-road. Next, Bret showed us how to lift a fallen bike. One of which I actually had to employ shortly afterwards. One way is to kneel and hold the subframe (it's strong and unlikely to be hot). Then you push the bike away from you, putting your chest on the seat and straightening your knees until the bike is upright. I liked this. The other way, he called it Monkey Lift, requires two people. The first chap puts his foot on the rear wheel and grabs the, er, grab rail fro the high side of the fallen bike. He pulls the bike upwards. This eases the job of the other person who lifts the bike up by the handlebar, simple. 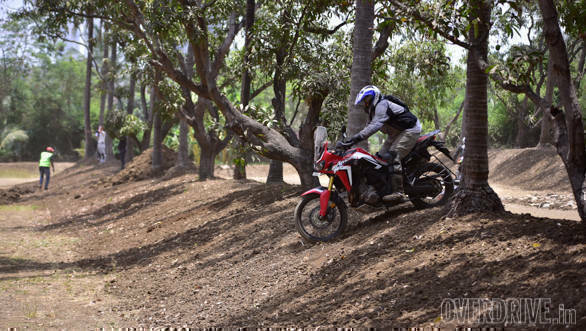 Apart from these skills, we rode through the rock sections, through the mud and over small obstacles to learn the right way to tackle these common features of off-road riding. Learning the other skills - balance, posture, throttle and brake control made this easy. As did the Africa Twin with its DCT automatic gearbox. I was worried about it because the clutch is an essential part of slow riding, right? But the 'Twin made this part easy by allowing you to use just the throttle and brakes, and the steering of course. I also didn't have to worry about what gear I was in. Eventually, I turned the rear ABS off and managed to learn to make tighter turns by opening the throttle and sliding the bike around. Power slides! Starscream would be proud. And jealous also. Rocks? trenches? brig it on. I am ready to conquer them all now. 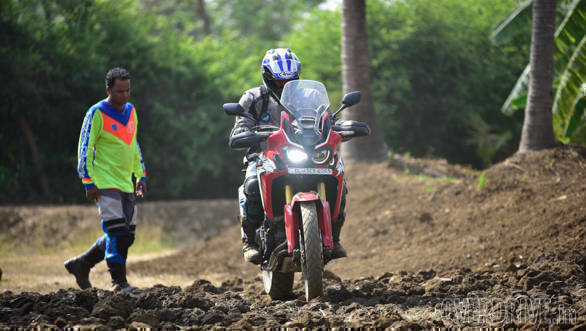 Participants who took part in the ADV training showed up on Triumph Tiger, BMW R1200 GS, Kawasaki. Ducati, Desert Sled and the Royal. Additionally, there were KTM and a Triumph. You must go to school. If our primary and secondary schools had motorcycles, I swear you'd have better memories of those 12 years of your life. 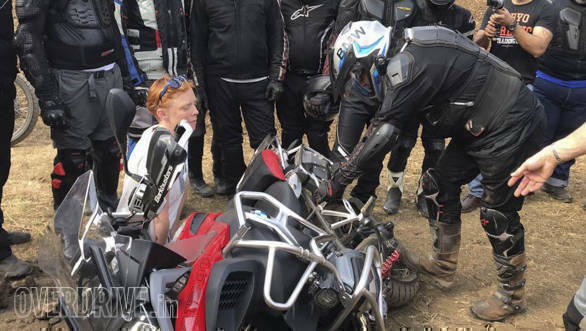 The Top Gun Adventure Riding School, and others like it, will show you a deeper understanding of your motorcycle and allow you to exploit more of its potential. Small things like the riding posture and balance make a huge contribution to your skill and confidence on the bike. And hey, they also teach you how to pick it up, just in case the confidence is greater than talent. 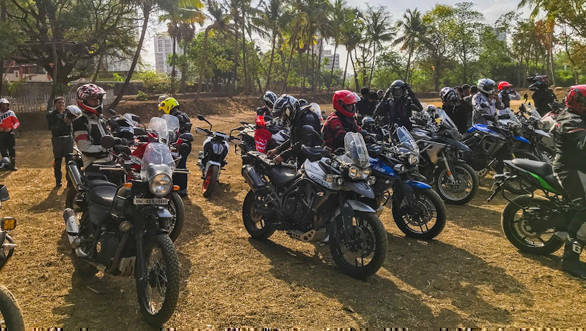 Keep an eye out, Vikrant Ghate and the Top Gun India Riding Academy plan to conduct more such training sessions in other cities in the coming months. I won't be there, of course, I'm now an expert.